A luxury fitness & wellbeing retreat in Kent, launched January 2018, by Kathryn Freeland. It offers residential private retreats for 1 guest or small parties & group day retreats. The emphasis is on wellbeing with balanced exercise, food and lifestyle for life (no fads). She helps start the journey to living the balanced life people strive for. Kathryn had the idea for the retreat whilst stressed out, foregoing her healthy lifestyle a few months before her wedding that she was planning and at the same time completing on Stede Court. She needed to get away, without the stress of airports, wanted to exercise her way not just bootcamp blitz or just yoga chill, she wanted healthy but 'normal' food, privacy & peace and a bespoke itinerary to rejuvenate her back to being her best. Kathryn has designed a bespoke exercise trail in her woodlands and uses her experience and many disciplines (inc HIIT, Yoga, Pilates, TRX, Boxing, Running) for highly effective and balanced workouts for everybody. She is qualified in nutrition and has helped many clients loose and keep weight off. At Stede Court she offers well balanced, tasty, nutritional, homemade fresh food. 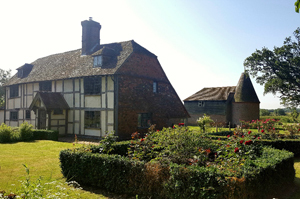 Stede court is a grade 2 listed, 5 bedroom country house set in 7 secluded acres of stunning formal gardens and fields, deep in the tranquil Kent countryside. The grounds have the exercise trail, a swimming pond with decking for meditating and relaxation, veg patch, Kentish coast, rose garden, croquet & bowls lawn and plans for a sauna. It is hassle free to get to, only 37 mins by fast train from London and only 90 minutes drive from central London. "Kathryn makes exercise exciting. I had lost my get up and go until she took me to the park- we used benches, trees and steps for challenging outdoor circuit exercises. Thanks to her encouragement and expertise I am outdoors at every opportunity. And her enthusiasm is infectious..."
"If you want to boost your fitness, drop pounds or kick-start a brand new exercise plan, this is my tried and tested foolproof fitness programme - it works." "Kathryn is a brilliant trainer." "Kathryns advice has been invaluable. No longer am I short of breath at the beginning of my run, with her tips for warming up, and advice on changing my running style I have been able to up my distance." "As a former confirmed couch potato and life-long back pain sufferer I am extremely grateful to Kathryn for her major contribution to improving my lifestyle. I used to hate the gym and exercise in general the fact that I've been training with Kathryn for over 7 years is a tribute to her. She makes exercise fun, varied and above all effective." "Kathryn is an incredible personal trainer." "Kathryn has helped me on so many things over the years. She is hugely knowledgeable and professional personal trainer and is always a delight to work with." "For years I used to go to the gym three times a week, doing the same routines on the treadmills and machines but not getting results. My friend recommended Absolute Fitness and now I train twice a week with my personal trainer in London, who motivates me and we have a great rapport. I love personal training outdoors, it's more challenging and stimulating and I have had fantastic results and am more toned in all the right places!"